A woman describing herself as a very close friend of the late Stella Kiarie, the Kenyan woman found dead in her car on the Loop 101 in Phoenix, Arizona, with a rope around her neck last Sunday is speaking out. In an interview with a local TV station, Ms Zoe Sarabo says she was close to Stella Kiarie, but says nothing gave her the sense that anything was wrong. “I’m still, you know, processing it all,” Sarabo said. Ms Kiarie worked for the state health department and was the foster mother to a one-year-old child. In a podcast she describes the joy of fostering a child. Arizona state troopers found Kiarie with a rope around her neck, and say she had injuries inconsistent with a car crash. DPS says it also found a car seat in the back of a vehicle, leading troopers to find Kiarie’s 1-year-old foster child home alone. Sarabo says Kiarie would never leave the child unattended. Meanwhile, Sarabo says some people concerned Kiarie. “Particular individuals she was afraid might scare her at some point or show up at her door,” Sarabo said. Though Sarabo added she doesn’t know if they were involved in Kiarie’s death. READ ALSO: Illegal immigrants turn to GoFundMe in effort to stay in U.S.
Sarabo says the last time she saw Kiarie was the day before she was found dead, at a birthday party for Kiarie’s foster child. Sarabo says she’ll remember Kiarie as a caring foster mother, and a woman with opportunities on the horizon. 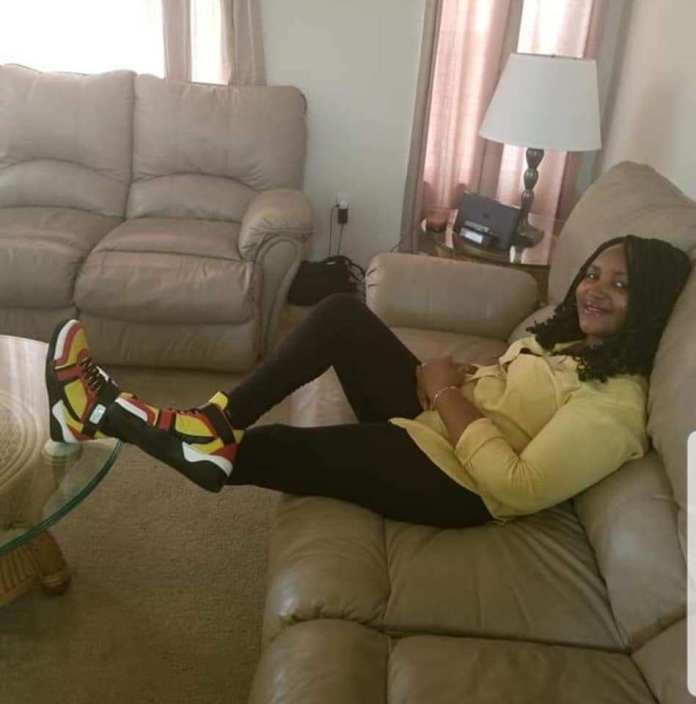 Ms. Richards has taken to social media to express her joy even as she thanked her customers who have made orders for the shoes. “How did I get to be so lucky as to have your love and support. You have encouraged me and reassured me of God’s love and promises to us. I am beyond grateful. I am overwhelmed with joy. Kenyans living in the diaspora are concerned that they might not get the new e- passports on time despite a deadline extension announced recently by the government and a directive by President Uhuru Kenyatta that the documents be issued in their countries of residence. Citizens living overseas who spoke to the Nation pleaded for the government to intervene and put things in order at its embassies abroad. On Friday, Foreign Affairs PS Macharia Kamau told the Nation his ministry was working with the Immigration Department to ensure centres for passport applications abroad started working. “We have identified missions where the programme will start. It is a process that has already been initiated,” he said. Embassies will first have to deploy more personnel, but Kenyans abroad were being encouraged to register on the diaspora portal. This, the ministry says, will help establish the areas to prioritise for the centres. Initially, the Interior ministry, which houses the Immigration Department, said it would start with a centre in North America, another in the Middle East and South Africa before expanding gradually. But a Kenyan residing in Germany expressed displeasure at the kind of services offered at the embassy in Berlin. “When we call at the Berlin Embassy it is hell on earth! They pick no calls and when they pick, they are so arrogant. How will we be able to travel? Even after protesting at the Berlin Embassy there is no change,” she said, requesting anonymity for fear of reprisals. But Ms Selline Branis Onalo, who represented Kenyans in Mexico and other central American countries described the tribulations they go through. As Kenya doesn’t have a resident embassy in Mexico City, it runs relations through the mission in Washington. “It is like the Embassy has forgotten its role in Mexico. Some of us tried to write to the authorities including emails to the Kenyan Embassy in Washington DC, which covers Mexico. We haven’t heard anything from them,” she told the Nation. In the entire Americas, Kenya has embassies in the US, Cuba, Brazil and Canada, collectively serving more than a dozen countries. Officially, the Ministry of Foreign Affairs manages diplomatic missions abroad. But specific services like passport issuance are provided by the same departments as at home. That means the Immigration Department will have to send attaches to all embassies to ensure the service is provided there. In September last year, Kenyans held peaceful demonstrations in Berlin to protest against poor services at the embassy. They also complained about how they were forced to travel back home to renew their passports. Later in December, Deputy President William Ruto announced that the deadline for obtaining new generation passports was extended from August 2019, to an unspecified date in 2020.